"This takes some time, but is well worth the effort. I use a food processor. It is a hearty soup, great on a cold winter night. Serve hot, topped with sour cream." In a large pot over medium heat, brown beef in oil. Stir in onion and water, reduce heat and simmer, covered, 2 hours, until meat is tender. Remove meat from broth and set aside to cool slightly. Stir carrots, celery, cabbage, beets, tomato juice, lemon juice, sugar, salt and pepper into broth. When meat is cool enough to handle, cut meat from bone and into bite-size pieces and return to soup. Simmer until vegetables are tender, 20 to 30 minutes. A tablespoon of dill put this into the "awesome" category. 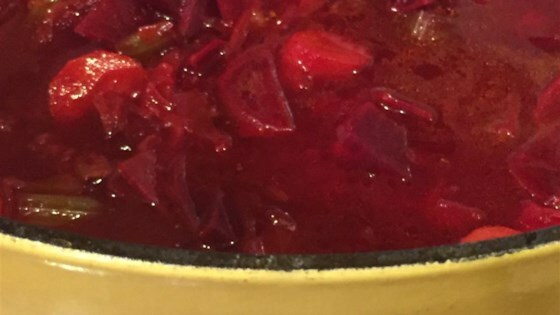 Made slight modifications to this recipe, based on Borscht I. Added dill weed. My husband loved this recipe. Thank you!